Suicide is when a person intentionally ends his or her own life. It is among the top 10 causes of death for adults in the United States. Suicide is a serious public health problem in the United States. In 2014, nearly 43,000 Americans died by suicide and there were more than 400,000 visits to emergency departments for self-inflicted injuries. Additionally, an estimated 9.3 million American adults reported having suicidal thoughts within the past year. Suicide has lasting harmful effects on individuals, families and communities. Furthermore, survivors of suicide may experience serious injuries and long-term health issues such as broken bones, brain damage, organ failure, depression, or other mental health problems. 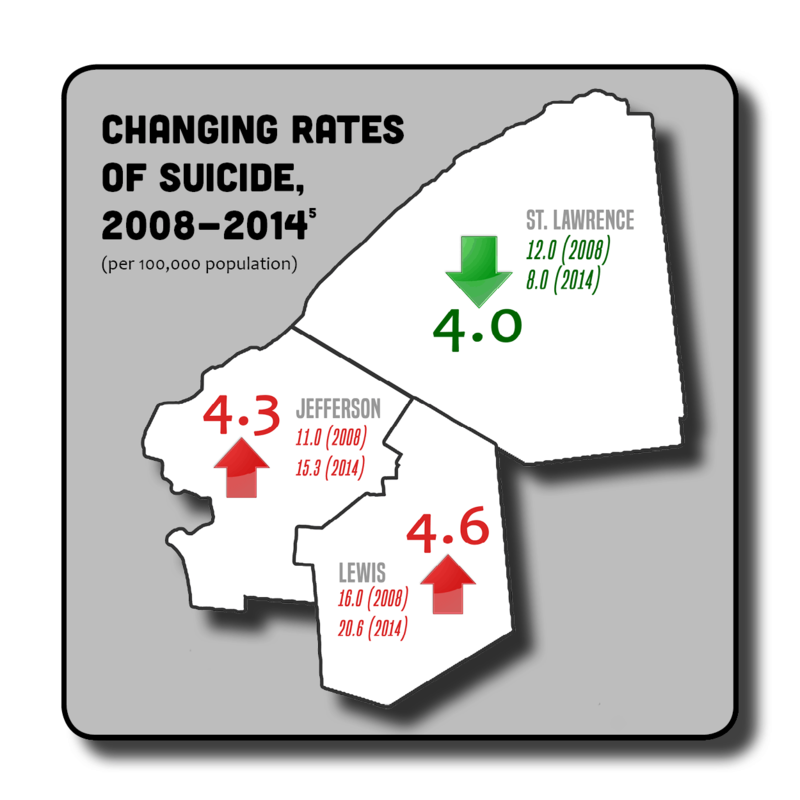 658 suicide deaths were reported across Jefferson, Lewis and St. Lawrence counties between 1990 and 2014 — that’s an average of 25 deaths per year, and an average of 31 deaths per year between 2012-14. In the past decade, 85% of suicide deaths have been men and 15% were women. However, with both men and women, suicide is most frequent between the ages of 40 and 60. 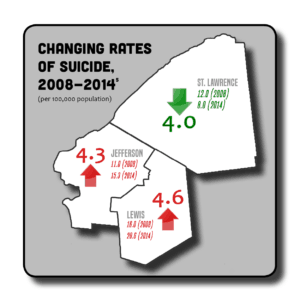 Between 2012-14, the region averaged 188 hospitalizations per year for self-inflicted injuries. 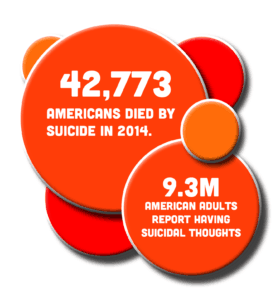 The causes of suicide are complex and often difficult to recognize or understand. Suicidal thoughts might be brought on by mental, emotional, environmental or other factors — all of which differ from person to person. However, there are certain risk factors and warning signs of suicide. For your safety, and for the safety of neighbors, friends and loved ones, it is important to know what they are. Everybody has a role to play in suicide prevention, and there are many ways to reach out when you think someone may be at risk. Warning signs may help determine if a loved one is at risk of suicide, especially if the behavior is new, different or has increased. Asking a person how they are feeling, listening to their concerns without judgement, following up, and helping them find resources in the community are great ways to lend a hand and keep friends and family safe. Next post What Does Population Health Mean?